Paul tells the other Christians who were gathered together, about his Missionary journeys. FTER PAUL AND Barnabas had returned from their missionary trip, some visitors came to the church at Antioch from Jerusalem. These men were Jews, and they had never yet understood how Gentiles can be saved the same as Jews, without obeying the commands that Moses had given to the Israelites. We remember that the law which God gave Moses to write in a book was intended for the Israelites, or Jews, only. The Gentiles had never kept the law, and many of them knew nothing about its teachings. This law had no power to save the people who obeyed it; the purpose of it was to separate people who worshiped God from those who worshiped idols. Without the law the Jews would have been as ignorant of the true God as were the Gentiles, while with it they could prepare themselves to receive the Messiah, whom God had promised to send into the world, for many passages in it spoke of him. These visitors from Jerusalem looked unkindly upon the Gentile believers and said, Except you keep the law of Moses just as we do you can not be saved." Paul and Barnabas had been among many Gentile Christians, and they had seen how these people received the Holy Spirit the same as did the Jews though they knew little of nothing about Moses' law. So these missionaries told the men from Jerusalem that they were mistaken, for Gentiles could be saved without keeping the law. This question was a serious one with every person who had been a strict Jew. A vision on the housetop was necessary in order to show Peter that Gentiles might be saved as well as Jews. And there were many other strict Jews who had seen no housetop visions. These were the Jews who troubled the Gentile believers. Finally it was decided by the church in Antioch that Paul and Barnabas should go, with certain other teachers, to visit the apostles in Jerusalem and talk with them about this matter. So the company started out, and as they went they visited other churches along the way and told about the success of the first missionary journey in far-off lands. And everywhere the disciples rejoiced to hear how God had blessed the Gentiles who believed in him. 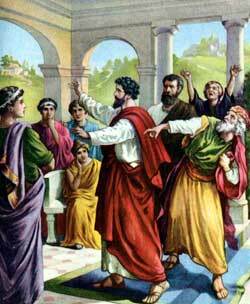 In Jerusalem the brethren from Antioch were received kindly by the apostles and the other teachers in the church. And soon they told why they had come. When their errand was made known, some of the teachers who, like Paul, had been strict Pharisees before they believed in Jesus, rose to talk. These men had not, like Paul, seen that believers in the true God and in his Son, Jesus, no longer needed to keep the law of Moses. They did not understand Jesus' teaching, that true religion shows itself in a pure life, and that people who know nothing about Moses' law can live pure and holy without keeping that law as did the Jews. Peter listened with the other apostles and with the visitors from Antioch to the speech of these Pharisees who believed in Jesus. When they had finished, others talked, and finally Peter told about his experience at Cornelius' home, in Caesarea, where many Gentiles received the gospel and were baptized. Then Barnabas and Paul told of their long journey in Gentile countries, where many turned from idol-worship to believe in the true God and in his Son, Jesus. James, the brother of Jesus, stood up as the last speaker, and every one listened quietly for they knew he had received wisdom from God to speak to them. He urged them to cease troubling the Gentile Christians about the keeping of Moses' law. He said, however, that they might write a letter to the Gentile believers, telling them to be careful not to do certain things which they had always done while they were worshiping idols. James's advice pleased all the assembly, and the apostles and teachers in the church at Jerusalem decided to write such a letter and send it by Paul and Barnabas to the Gentile Christians in Antioch. This they did, and they also sent two of their own preachers, men named Judas and Silas, with the missionaries. A large audience of eager-faced people greeted the company when it arrived from Jerusalem. And they listened carefully to the reading of the letter that the apostles had written and sent by these men. When they heard that they would not be demanded to live like the Jews in order to please God, they rejoiced greatly. And they continued to worship God with pure hearts, obeying the teachings of the gospel. Judas and Silas, the men who came with Barnabas and Paul, spoke encouraging words to the believers, and urged them to cling to their faith in Jesus. Then, after certain days, Judas bade them good-by and returned again to Jerusalem. But Silas chose to remain with the church in Antioch.